"Wat, Honolulu Star-Bulletin, You Going Leave Me Now?!" is among the comedy numbers included on Frank DeLima's latest album, "Frank DeLima Live at the Captain's Table." The album, in CD and cassette, is scheduled to arrive in stores early next week. The Star-Bulletin song, set to the music of "Lucille," was being played on KSSK yesterday. DeLima and musicians David Kauahikaua and Robert Nishida, recorded the song Oct. 2 during a nightclub show at the Captain's Table Lounge in the Hawaiian Waikiki Beach Hotel. You Going Leave Me Now?! I saw he was crying, but I'm not one for prying, so I stared as the teardrops went splat. 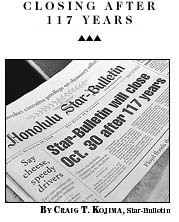 What Honolulu Star-Bulletin, you going leave me now?! In a world without Kwon, I won't know who won, until the next morning at best. You got all those news jocks, you got Leslie Wilcox, the hell if you ever get me! He said, "What the heck, I'll show some respect, for those hundred and seventeen years!"